Today is Tammy’s birthday and for the first time since I arrived in Chicagoland, I won’t be able to celebrate it with her. 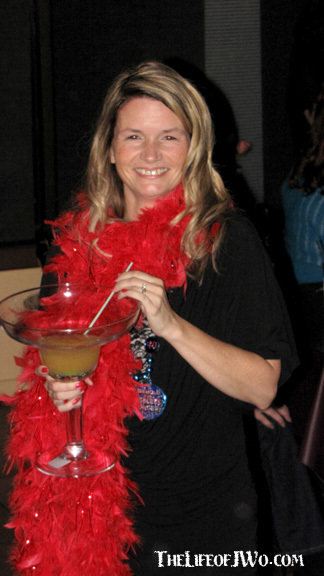 Tammy nurses from Big Moe during her recent milestone birthday. Not that I had something planned or anything since it’s not one the milestone birthdays (we one of those a few years ago). It’s just kinda sad knowing I’m waking up in Mississippi this morning instead of surprising her with cards and little gifts or making her a special breakfast before she leaves for work. Birthday’s have never been big deals to us, but I always try to do something special for her, like putting a card in the bathroom while she’s in the shower and another card behind her steering wheel, or putting some candy in her purse/work bag. When she found out that I was going to be out of town on her birthday she told me not to send her anything or do anything special and she means it. Don’t get me wrong, she appreciates if sent her flowers to work, but I’d catch hell about spending too much money on them. However, she did tell me that I’ll have to “make it up” to her when I get back. I’m pretty sure that means I should look the other way when she buys stuff from Ann Taylor. I just know that I wish she was next to me this morning and that she would be keeping me company as I drive to Nashville this morning. Instead I’ll have to settle for talking to her on the phone and singing loudly to Kid Rock, Sammy Hagar or any of the other 80s hair bands I have on my iPod in her honor. Happy Birthday Tammy, I miss you and I’ll be home soon. Gallery | This entry was posted in Daily Life and tagged daily life, family, humor, life, postaweek2012, Tammy. Bookmark the permalink. Happy, happy birthday, Tammy! Mine is next week! Too bad we can’t celebrate by shopping at Ann Taylor together! Big Moe looks large enough to house a couple of goldfish. Happy Birthday Tammy — Jason turn your head and tell her to enjoy Ann Taylor…and don’t even think of asking about it later. Aww sweet! Happy birthday Tammy! I’m next week. Crazier? Sharonlee how is that possible? Are you now wroking 26 hours a day?My birthday was actually very nice. I was well enough to leave the house and run a few errands, I am sitting MUCH better and for longer periods, and I had good friends deliver a good dinner and sing to me. Texteen’s singing his song tomorrow night but he did tell me about his A+. Spoke with my folks on the phone.